Finished in white, this dining set combines the clean lines of a transitional design with the unique addition of a bamboo effect in the chair back. 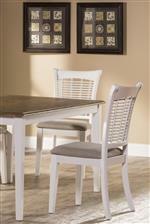 The matching chairs and stools have an off white colored woven fabric seat. The tables, available in both round and rectangle, each claim their own fabulous features. The round has a simple gently carved pedestal base. Made from hardwoods, this group is composed of both solids and climate controlled wood composites to prevent cracking and splitting from changes in temperature or humidity. The Bayberry White White Five Piece Dining Set by Hillsdale at Stoney Creek Furniture in the Toronto, Hamilton, Vaughan, Stoney Creek, Ontario area. Product availability may vary. Contact us for the most current availability on this product. The Bayberry White collection is a great option if you are looking for Traditional furniture in the Toronto, Hamilton, Vaughan, Stoney Creek, Ontario area. Browse other items in the Bayberry White collection from Stoney Creek Furniture in the Toronto, Hamilton, Vaughan, Stoney Creek, Ontario area.